These spirited, rhythmical and poignant bilingual songs from Bob Hurd reflect the deepest feelings of the human heart—a thirst for justice and a hunger for God. This collection has been an OCP favorite for decades, bringing together Spanish and English-speaking assemblies with bilingual songs. The song “Pan de Vida”, one of the oldest bilingual worship songs (written in 1988), was inspired and written while Bob was living in Guatemala. He had been searching for songs that were not just translated from English to Spanish or vice versa, but music that allowed participants to cross over and sing back and forth from one language to the other. Listening to all the songs on this collection, you will find the influence and nostalgia of the folk guitar and gospel chords that Bob grew up with, as well as a variety of harmonies and Latin American rhythms. Reflecting on the songs in this collection goes beyond singing the lyrics, Pan de Vida is about welcoming a different culture, about being open to receive an invitation from God and to extend our own invitation to the minorities in our community. Our challenge is to not only worship, but also to have our own conversation with the Scripture and see it as a personal life lesson. 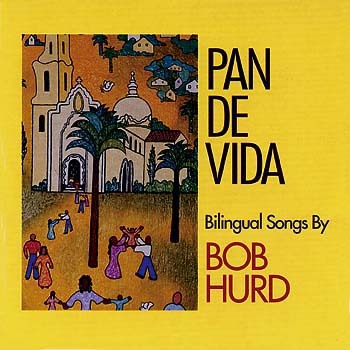 Using the melody of “Pescador de Hombres," one of the most famous Spanish Communion songs, Bob's “Pan de Vida” is a turning point for Spanish worship music, making it an inspiration for Hispanic and English–speaking composers who now write bilingual music that unites different communities that speak different languages but share the same faith. Bob believes that when you sing music in another language, you acknowledge your community as a family, seeing your neighbors as sisters and brothers, the way Jesus intended us to. Pan de Vida is the perfect collection for the English-speaking assemblies looking to make room for Spanish speaking parishioners.